Stay cool and hydrated. Drink water, at least two to four cups (16-32 ounces) upon rising, and similar amounts if you are going out for activities and exercise. Carry water with you in a hard plastic container (more stable polycarbonate rather than polyethylene that leaches plastic into the water). You may also use a traveling water filter. Check your local water stores. Most people need two to three quarts of liquid per day, and more in hot weather or with sweating and exercise. Keep up or begin an exercise program. Aerobic activity is important for keeping the heart strong and healthy. If you only work out in a health club, take some time to do outdoor refreshing activities — hiking, biking, swimming, or tennis. Reconnecting with these activities will help keep your body and mind aligned. Enjoy Nature’s bounty – fresh seasonal fruits and vegetables at their organic best. Consuming foods that are cooling and light — fresh fruits, vegetable juices, raw vital salads, and lots of water — will nourish your body for summertime activities. Include some protein with one or two meals. There are a number of light, nourishing proteins that don’t require cooking. Most of these complement fruits and vegetables nicely– nuts, seeds, sprouted beans, soy products, yogurt, kefir, and cottage cheese. Fish and poultry can also be eaten. Relax and breathe. You’ve been working hard. This is the season to slow the pace a bit and absorb the light that stimulates your hormonal message center. Leave your cell phone at home or take a week off from TV. In many European countries, most of the population has a month off during the summer. Sun teas are wonderful. Use flowers and leaves (or tea bags) in a clear half- or one-gallon glass jar filled with spring water. Hibiscus or red clover flowers, peppermint, chamomile, or lemon grass are all good choices, or use your local herbs and flowers that you learn are safe, flavorful, and even medicinal. Leave in the sun for two hours or up to a whole day. Moon teas can also be made to enhance your lunar, dreamy side by letting your herbs steep in the cooling, mystical moonlight. Add a little orange or lemon peel, or a sprig of rosemary and a few jasmine flowers. Nutritional supplements can support you with a greater amount of physical energy, enhancing your summer activities. The B-complex vitamins are calming to the nervous system and helpful for cellular energy production, while vitamin C and the other antioxidants protect your body from stress, chemical pollutants, and the biochemical by-products of exercise. Helpful summer herbs are Siberian ginseng as an energy tonic and stress protector, dong quai is a tonic for women, hawthorn berry is good for the heart, and licorice root will help energy balance and digestion. 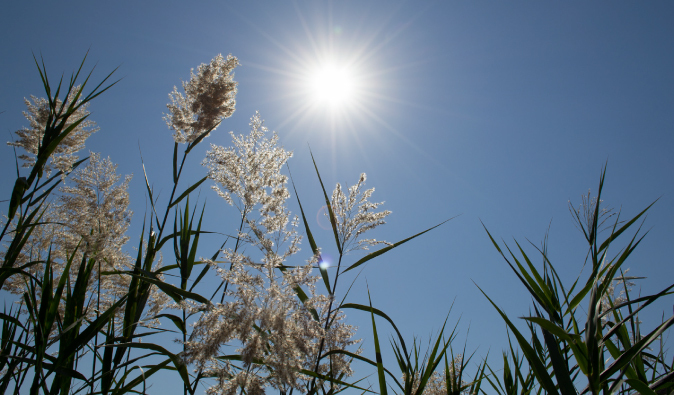 Use the summer months to deepen the spiritual awakening begun in the spring. Begin by checking your local bookstore or the web for ideas that interest you. Plan a vacation that incorporates these new interests and provides you time to read, relax, contemplate, and breathe. Above all, give yourself the time to truly experience Nature. This can happen, even in a city park, if you relax and let in your surroundings. When traveling, take activities for the family and your first aid kit for bites, bee stings, and injuries. 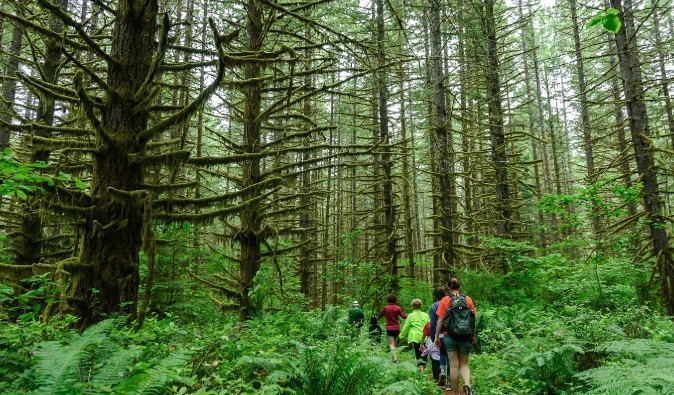 Check for ticks after your hikes. Watch for overexposure, take time in the shade, and drink your water. There are so many reasons to love the summer time: the green grass and warm sunshine, longer days and warmer evenings, more time to savor all the beauty of the outdoors. But the best part by far is the amazing abundance of healthy, fresh, whole foods everywhere you look. In celebration of the richness of the season, here are 10 reasons why there’s no better time to eat well. It’s easy to eat fresh, locally grown food when fruits and vegetables are as abundant and available as they are during the summer months. And when food is more available, it’s more affordable, too, since choosing local produce cuts the cost of shipping food from some far-off place. When food is in season, it’s better for you. Except for freezing, most food storage practices cause a loss in nutrition and quality. Think of all the preservatives and toxic chemicals used to keep packaged foods from going rancid on grocery store shelves. 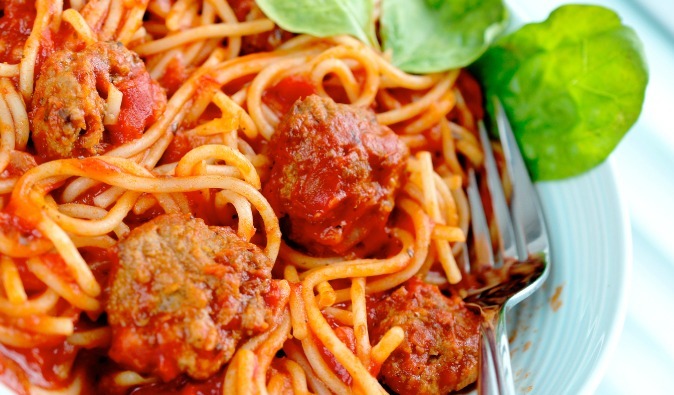 Beware these processed and preserved foods that can’t die. Fresh food is alive, filled with all the nourishment and nutrients needed to keep you alive and thriving! Eating locally is not only healthy for you, it’s great for your community, too. Participate in the grow-your-own movement by shopping at your local farmers’ market or join a CSA (community supported agriculture). See www.localharvest.org to find a CSA or farmers’ market near you. For more adventurous ways to go local, try that interesting little farm stand you drive by during your daily commute (they usually offer great value for seasonal fruit and veggies) or try a pick-your-own farm. Summer is all about unwinding, relaxing, and enjoying the simple pleasures of good food and good company. Always keep basic staples in the pantry, so you’ll be ready for an easy, impromptu meal. They don’t need to cost much. To eat well, you don’t have to indulge in expensive specialty foods or the new, trendy exotic fruit du jour. Keep it simple. Summer offers so many ways for you to add flavor to your food without resorting to salt and fat. Herbs, spices, and berries are all plentiful during the warmer months. Get creative, and experiment using herbs like basil, cilantro, parsley, or fresh dill. In the summer time, these are so easy to grow right in your own window! Produce is available in huge quantities and varieties during the summer months. This wide array of options makes it easy to enjoy a light, plant-based diet, which can keep your heart healthy, your waistline slender, and your blood sugar levels optimized. Try incorporating meatless Mondays into your weekly meal plan or try eating at least one meal a day without animal protein. This can help you lighten the load on your digestive system, as well as on the Earth, since raising animals for food has a greater impact on the environment than growing fruits and vegetables. Tip: Choose non-GMO tempeh to replace ground beef in your next recipe. This one change will drastically trim your shopping bill, because tempeh costs about a third of what you’d pay for the amount of meat needed to feed a family of four! Remember all those leftover berries from the pick-your-own farm or all the fresh zucchini you found from the farmers’ market? Don’t waste them — re-use them! Left over fruits and vegetables are awesome toppings for salads and add a side of protein of your choice. Add flare to your normal weeknight routine by creating your own summery dinner table outside. No need to go to fancy restaurants to make your meal feel special; decorate your outdoor table with some candles, stones, or fresh flowers to enhance your dining experience! Invite friends over. Make it a potluck! Relaxing under the stars, enjoying a fine meal with friends, will soothe your nerves and help you digest your food, while truly appreciating the magic of summertime. While it’s sometimes OK to choose the conventional versions of fruits and vegetables, whenever possible, it’s best to opt for organic. This limits your exposure to pesticides, fertilizers, hormones, drugs, and other toxins that can be found in conventionally grown food. When you buy from local farms, you can find fruits and vegetables that are just as nutritious as their organic counterparts, with one distinct advantage: to reach you, locally grown produce doesn’t have to travel the thousands of miles across which some organic foods are shipped. This extra time spent in the back of a truck can make them more costly, yet less nutritious. When it’s cold out, stews, soups, and slow-cooker meals are best. But these take time to prepare and cook. Summer is all about quick and easy meal prep. Your body craves raw or lightly cooked food, which means less time for you in the kitchen. This gives you more time to get outside and enjoy summer’s simple pleasures. Summer fruits and vegetables grow in a variety of beautiful colors that make food more pleasing to the eye, and the more beauty on your plate, the more pleasure you receive from your meal. The more pleasure you feel, the less likely it is you’ll overeat. But the beauty of these colorful fruits and vegetables is far more than skin deep. These colors are nature’s way of advertising the phytonutrients, or special, healthy chemicals, they contain. The more color, the better! Summer salad greens are in abundance either growing in your garden, home made greenhouse or deck top container pots. Use salad greens or romaine lettuce as your base and add left over lightly steamed, chopped or grated fresh vegetables, boiled egg, grated cheese, nuts and seeds, fresh or dried fruit, fresh chopped herbs, cooked protein like chicken or salmon, etc…….. Purchase organic, GMO and preservative free salad dressing or simply make your own. Higher temperatures may translate into more time spent outdoors, but for pet owners, they can also mean more visits to the veterinarian. “In the summer, we see more skin and ear infections and an increase in injuries overall,” says Sandra Sawchuk, DVM, a veterinarian at the University of Wisconsin–Madison. 1. Shield delicate skin.Skin cancer is the most common form of cancer in dogs and the second most common in cats. Even though fur provides some protection from the sun, you should apply a pet sunblock every 3 to 4 hours to the least-hair-covered spots: bellies on dogs (especially ones who like to lie on their backs) and ears and around eyes on cats, which are also areas where malignant tumors are likely to show up. (No need to apply sunscreen directly on fur.) Use products made specifically for pets. While it may seem logical to cut your pet’s coat short, resist the urge. “If hair—even long hair—is brushed and not matted, it provides better circulation and helps regulate body temperature,” says Rene Carlson, DVM, president of the American Veterinary Medical Association. 5. Never leave her in the car. 6. Look out for heat exhaustion. If your dog shows signs of heat stress—heavy panting, dry or bright red gums, thick drool, vomiting, diarrhea, or wobbly legs—don’t place her in ice cold water, which can put her into shock. Instead, move her to a cool place, drape a damp towel over her body, rewet the cloth frequently, and get her to the vet as soon as you possibly can. A dog’s normal temperature is between 100° and 103°F, so once she hits 104°F, she’s in dangerous territory (106°F or higher can be fatal). 7. Keep it cool indoors. Turn on the AC in your home, especially if you’ll be out of the house for several hours. If it’s too warm for you, it’s too warm for your pet. Have your dog wear a life vest in a bright color in any body of water to help her stay afloat and ensure that she can be seen by swimmers and boaters. Let her get used to wearing it in your yard first. 9. Beware of currents and riptides. If a dog gets in trouble in one of these in the ocean, whether while swimming or fetching a ball, she can be swept out to sea in minutes. The same goes for rivers: You need to watch out for currents, even if they’re not readily visible, as your dog can be easily carried downstream. 10. Be on the lookout in lakes. 11. Act like a lifeguard. Never leave your dog unsupervised near an uncovered pool. 12. Create an exit strategy. Teach her how to get out of the pool by using the stairs with her 5 to 10 times in a row. This will help her learn where the stairs are, whether she’s swimming or accidentally falls in and needs to climb out. In the deep end, consider putting in a pool ramp, such as the Gamma Skamper Ramp ($60 to $100; amazon.com), to reduce risk of drowning. 14. Opt for pet-friendly insect repellents. 15. Avoid using charcoal briquettes. Dogs seem to love to lap up or steal charcoal briquettes from the grill, and the briquettes can easily get stuck in the stomach, causing vomiting and requiring surgery. Barbecue scraps and fatty leftovers can give your pup pancreatitis, causing severe abdominal pain or death. Corn on the cob and peach pits are also a huge no-no because they can lodge in a dog’s intestines. Daylilies and Asiatic, Easter, or Stargazer lilies and their pollen can cause acute kidney failure in cats. Ingestion of as little as two to three leaves can be fatal, so remove these plants from your yard if you let your cat out. 19. Lock up plant food. 20. Keep them away from fireworks. A threat to curious dogs that might try to eat them, fireworks are made with chemicals like potassium nitrate and parts (like a fuse) that could get stuck in the stomach. If eaten, fireworks can cause vomiting, bloody diarrhea, seizures, and shallow breathing. Keep yours out of reach, and clear your yard of debris after you set off your display. Independence Day brings lots of great activities but also lots of opportunities to come into contact with toxins. Pregnant women and parents with young children might want to pay some extra attention to the additional toxins their little ones are exposed to at this time of year. While no one likes a Debbie Downer, being mindful of our health is not the same as denying yourself and your family a fun time. Getting sick is certainly no fun! Most kids and adults can handle occasional treats, but toxins do accumulate in all of us. We know from the Environmental Working Group that babies are born now with over 200 chemicals in their umbilical cord blood, including BPA. Adults and children who are already compromised in some way or who have poor detoxification for genetic reasons, liver issues, or unhealthy diet would be served well by paying attention to their choices this holiday. It’s best to see them from afar to limit what you breathe in and skin exposure as well. See articles about the chemicals in fireworks from Holistic Help and Newsweek and more thoughts on safe firework use from Healthy Child, Healthy World. Breathing in lead fumes can cause permanent damage so best to avoid those sparkly sticks. See this article from Lead-Safe America. Most large metropolitan areas get an F for air quality and you can look up your city in the American Lung Association analysis. If the air is especially unhealthy, it really is best to stay inside. Limit outdoor activity to morning when there is less ground-level ozone, or smog. See AirNow.gov for real-time levels and the American Lung Association for general information about air quality at its State of the Air website. Some face paints have lead and other chemicals that you would not want to eat. Your skin is your body’s largest organ, so best practice is to treat it like another mouth! Check out these articles on face paint from A Child Grows in Brooklyn blog and Baby Center. Yes, there are some chemicals there, too! Learn more at The Stir, Eco Child’s Play and from the FDA, which cautions against using them. Whether it’s food storage or trinkets from the dollar store, plastic seems to be everywhere. But there seems to be ample reason to avoid it when you can. There is evidence that BPA-free is not good enough and that its alternatives have issues too. See related articles at Mother Jones and Scientific American and a guide to plastics from Healthy Child, Healthy World. Many dollar-store trinkets are health hazards. See this NBC News report for starters and “1 in 3 Toys Contains Toxins, Study Finds” a great recap on Healthy Child, Healthy World of the research from The Ecology Center’s Healthy Stuff project. Even knockoffs of Loom Bands may be problematic. See this article by Mother Jones that talks about cancer-causing phthalates. All kids like to dress up, but many of them also like to chew on things that could be filled with bad chemicals. Check out this article from Alternet on the toxins in Mardi Gras beads with lead and endocrine disruptors. Plastic flags and the like could have a host of other problems. The less healthy our food choices, the more work our body has to do to detoxify from all the chemicals we come into contact with. When possible, choose local or organic. Some foods, like sweet corn, should be certified organic or else are likely to be genetically-modified. Other foods that are harder to grow in certain places may be polluted with pesticides if not organic. See the Dirty Dozen and Clean Fifteen lists from the EWG. Seek out local produce grown by farmers who, even if not able to pay for organic certification, tell you they do not spray with pesticides and/or use Integrated Pest Management (IPM). 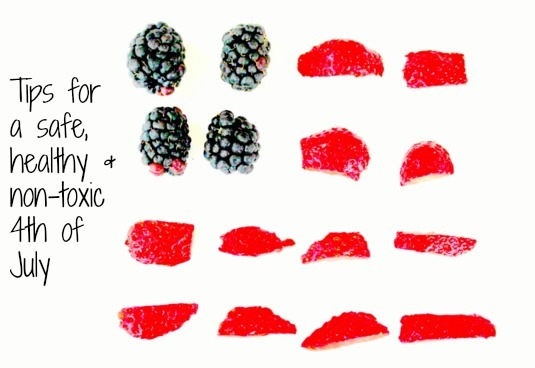 Quick Tips for a Safe, Healthy & Non-Toxic 4th of July … and the rest of summer! Play outdoors in the morning and away from highways. Smile, breathe, and drink a lot of water! Bugs BeGone is a DEET-free natural insect repellent, made with six different oils whose aromas, so pleasing and attractive to humans, keep the bugs away. The essential oils are combined in a synergistic way to magnify their effectiveness and then blended into a base of water, aloe vera, and polysorbate. The main essential oil is Eucalyptus Citriodora, or Lemon Eucalyptus, which has a fresh, sweet, lemon-like fragrance. The Center for Disease Control states Eucalyptus Citriodora is effective against mosquitoes carrying the West Nile Virus and Zika virus. The other oils are Rosemary, Sweet Lavandin (Grosso), Eucalyptus Citriodora, Peppermint and Catnip. It effectively repels mosquitoes, ants, fleas, chiggers, ticks, gnats and other insects. Also consider the Bugs BeGone Synergy Blend to make your own mixture. Muscle Tension Roll-On Relief is packed with anti-inflammatory, pain-relieving essential oils. It is a convenient and cost-effective way to keep muscle pain under control with no side effects. Keeping fit can result in sore muscles and (if we’re not careful) sprains, strains and soreness. This blend is excellent for easing occasional aches and pains that come from living life. It contains Birch, Eucalyptus Radiata and Lemongrass essential oils. Birch is anti-inflammatory and said to be excellent for massaging sore muscles, sprains and painful joints. It is also said to be anti-spasmodic and antiseptic. Eucalyptus Radiata is said to be warming and pain-relieving. It is traditionally used for arthritis, muscle and joint pains, rheumatism, sports injuries and sprains. Lemongrass is soothing and helps to warm and relax tense muscles. Together, the essential oils in this roll-on will help tense bodies feel better. Muscle Tension & Cold Relief Body Oil is a warming, analgesic blend of Amrita’s fine body oil base with luxurious essential oils. Birch is traditionally used to reduce pain, whereas Eucalyptus Radiata is used to increase blood flow to the tissues, and Lemongrass to warm and relax tense muscles. This body oil is ideal for the cold and flu season and helps relieve stress. Certified Organic Sandalwood Perfume is easy to use. It can just be rolled on. Sandalwood is like taking a deep breath in a luscious forest. It is said to clear the mind of superficial concerns, provide a sense of higher purpose and remove anger. According to Ayurveda, it is cooling, so it’s good to use during summer. Deep Rest Roll-On Relief is a blend of essential oils for sleep. It contains Red Mandarine, Lavender Extra, Sweet Marjoram and Mandarine Petitgrain Essential Oils. Red Mandarine and Mandarine Petitgrain are said to be mood-enhancing and tension-relieving, and give the blend its sweet citrus scent. Lavender is known for its relaxation effects and it is said to help dissolve negative thoughts and the worries of an overactive mind, thereby preventing insomnia and enabling sleep. Sweet Marjoram is said to be calming and stress-relieving. This blend may also be used during the day as a secret weapon against times of intense stress. Consider the Deep Rest Synergy Blend as well. Getting sick is a part of everyday life, and being on the road doesn’t exempt you from that fact, especially when travel itself it exposes you to a whole new range of bugs, parasites, and environments. The fact of the matter is the longer you are traveling, the more likely you are to pick up a bug or two. The key to minimizing the chances of this, however, is to actively combat the risk factors of becoming sick in the first place. The last thing you want to do is to expose yourself to any more risk than you have to. Prevention is far better than any cure. I know this sounds basic, but it is surprising how many people forget it, and as a nurse, the simple act of washing your hands has been drilled into me since day one of basic training as a key component in infection control. The National Health Service (NHS) in the UK has had a huge impact on controlling infection in a clinical setting simply by reinforcing the importance of washing your hands, but the same is true for every aspect of day-to-day life, and traveling the world is no exception. Hand hygiene is essential to stop the spread of infection and can dramatically reduce your chances of diarrhea, vomiting, food poisoning, gastroenteritis, flu, norovirus, MRSA, or even hepatitis A. Many travelers carry small bottles of hand gel, and these are great as a backup, but they aren’t a replacement for good old soap and water. Wherever possible, wash your hands under hot water for at least thirty seconds before and after eating and always after going to the toilet. When you can’t be sure of the purity of the local water or you are traveling in areas where sanitation is not that great, then it should go without saying that you should avoid the local tap water. Even if locals drink it without any problems, your stomach may not have the right bacteria to protect you from becoming ill, avoid local water — even ice in your drinks — in countries that don’t purify their tap water. 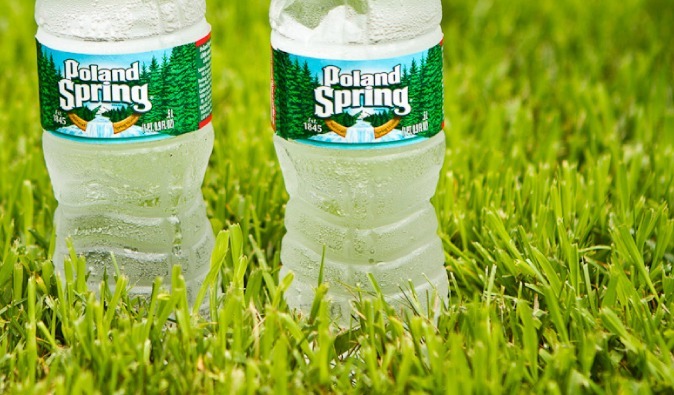 I recommend that at the very least you should always drink bottled water and double-check that the seal is intact on the bottle top too (a common scam is to sell bottles refilled with tap water). It is also a good idea to use bottled water to brush your teeth. But personally I prefer to use a water bottle with a built-in filter as this reduces the need to buy bottles of water constantly, saving both money and the environment. Food contamination is one of the biggest causes of traveler’s diarrhea and gastrointestinal problems on any travel adventure. If you are not careful with your food on your travels, you could potentially be exposing yourself to diarrhea, E. coli, Shigella, Salmonella, Giardia, Entamoeba hystolytica, Campylobacter, Cryptosporidia, Cyclospora, cholera, and much more nastiness. You should always ensure — as much as is practicably possible — that any food you eat is fresh, cooked thoroughly, and served piping hot. I love street food for this very reason, as you can see how clean the cooking environment is, and the food is often prepared right in front of you. But look out for signs of good hygiene practice at any street food stall or food court you eat at. Does the person handling the food wear disposable gloves and change them frequently? Is there a separate person handling the money or, at the very least, does the person cooking the food remove and replace gloves every time they handle cash? Is hand washing a regular occurrence? Is raw food left out in the open or is it stored correctly? These things may seem inconsequential but they are important. Food that is shared, such as in buffets undercooked, raw, or reheated food, especially meat, fish, or rice. You probably aren’t going to avoid a bit of stomach upset completely on your travels — especially if you are traveling long term — but if you are aware of good food hygiene practices and follow them as much as possible, then you can at the very least minimize the risk of becoming ill. 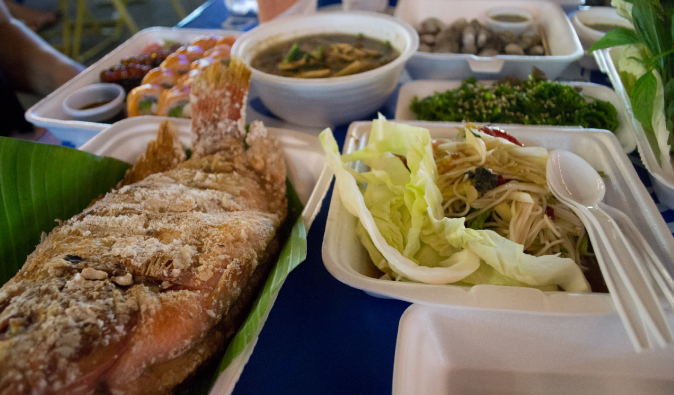 Eating local food and delving into the local cuisine is one of the absolute true pleasures of traveling and one you should never miss out on, but that said, a degree of common sense is needed too. Jumping straight into a diet of spicy curries or predominantly red meat is a good way to ensure some form of gastrointestinal upset if your stomach isn’t used to it. Food intolerances happen when your gut can’t properly digest the food you’ve eaten, or you’ve introduced something completely new and different to it, which can irritate the digestive tract and lead to stomach pain, cramps, gas, diarrhea, vomiting, and heartburn. Don’t worry — this generally isn’t serious and will pass relatively quickly. The trick to trying new foods and new cuisine is to mix it up a little bit. If you have a sensitive stomach, take it easy at first and don’t be afraid of eating familiar food from time to time. One of the best ways to stay fit and healthy and fight off unwanted infections is exercise. The benefits of exercise are well known and well documented: it improves your overall health and well-being and strengthens your immune system, which makes you less susceptible to illness. And if you do get sick, your body is better able to fight off the infection and more quickly get you back on your feet. It isn’t foolproof, of course, because fit people still get sick, but in general the fitter you are, the better your body will be at shrugging off that annoying bug or illness. I always try and maintain a healthy lifestyle, and that doesn’t change because I am traveling. If you aren’t active or fit before you start traveling, use it as an excuse to start! Go on a jungle trek, go hiking into the countryside or up a mountain, swim in the sea, go for a jog — whatever tickles your fancy as long as it gets you a little out of breath. Sunburn can seriously ruin a good travel experience! I got very badly sunburned years ago in Thailand after snorkeling for too long and forgetting to reapply sun cream. It is not an experience I want to repeat! Protecting yourself from the sun goes beyond getting bad sunburn though. You should also stay well hydrated if you are traveling in a country or region with a hot or tropical climate, as well as cover up with loose clothing and even a hat or scarf. If you don’t, then dehydration can set in very quickly, and that can lead to more serious conditions such as exposure, heat exhaustion, and heatstroke, which if left unattended can become a medical emergency. I once cut a day’s sightseeing short in Egypt when I spotted the signs and symptoms of heat exhaustion developing in another traveler and had to help her to get rehydrated and cooled down. It happens a lot more easily than many people think so be sensible, use sunscreen, cover up, and stay hydrated. Mosquito bites are an absolute nightmare for any traveler. At best they will simply annoy you with painful and itchy welts, but at worst they can transmit a whole variety of diseases, such as yellow fever, dengue, Japanese encephalitis, and chikungunya, not to mention malaria. Mosquitoes can be a problem in many parts of the world, but the Centers for Disease Control and Prevention (CDC), the World Health Organization, and the NHS’s Fit For Travel site are excellent places to find out where there are outbreaks of diseases such as dengue or malaria. 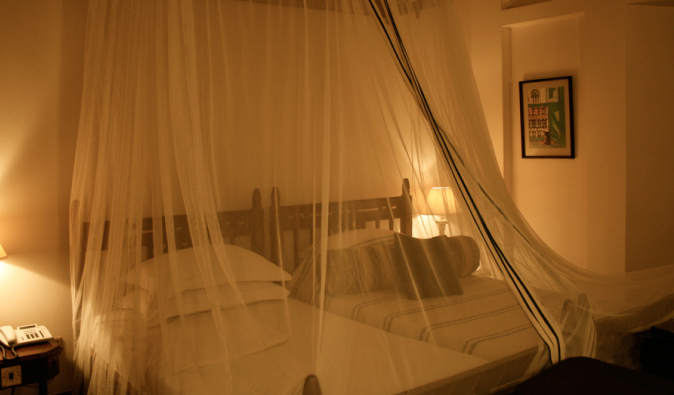 Air-conditioned rooms are great for minimizing mosquito bites, as they are often better sealed and less likely to let them in. Cover up. Wearing the right clothing is essential. Wear light, loose cotton clothing that covers most of your skin, especially around peak exposure times and places, for example, near bodies of water or at twilight or after dark, the peak time for malaria-carrying mosquitoes to feed. Sleep under permethrin-coated nets where necessary. Use anti-mosquito coils and plug-in devices where appropriate. Always apply a good dose of 30–50% DEET spray, and reapply it regularly. Some people prefer more natural alternatives, but these are often not as effective or are often not clinically proven to be effective at all. It is important to remember that none of these methods is completely foolproof. You can do everything right and still get bitten. I once caught dengue fever in India despite taking all the usual preventive measures, and it was one of the most unpleasant travel experiences of my life. It isn’t nicknamed “breakbone fever” for nothing! However, you can always minimize your risks with the tips above. As school is about to go back, many people have to travel. Here are some tips that might help make it a bit easier on your body. According to Ayurveda, traveling increases the Vata body type. Vata is already the quality of “movement”, so by traveling you are making it worse. This can cause your skin to feel dry and for you to get what I call a “travel tummy” where you end up spending far too much time in the bathroom. To reduce Vata while you are traveling, try as much to stick to a normal routine (e.g. go to bed on time) and eat warm oily foods. Listen to calming music and to rest whenever you can. You may like to put a Vata tea bag in the bottle of water you buy once you are in the actual airport. If you can, giving yourself an oil massage with Calming & Regenerating Body Oil each morning will help. Rosemary Verbenone Essential Oil Organic (prepares you for action). You may be interested to know that Amrita has a new car Dashboard Diffuser. And our Ceramic Angel Car Diffuser is also still available. The Amrita Ball Diffuser is small enough to take with you so you can even diffuse in your hotel rooms at night. If you have any trouble sleeping (which often happens in strange beds), consider the Deep Rest Oil or Deep Rest Roll-On Relief. Take Golden Shield Tri-Essence Power Blend. Jet lag can cause fatigue, headaches, insomnia and make it hard for you to recover from your trip and to go back to work or school. Take a 3oz mist bottle, and add pure water and a few drops of whichever essential oils appeal to you from the list below to create a blend. Ideally create a blend to use each morning and another to use each evening as this will help you to reset your internal clock. Shake it well and then spray it on your face, body or around the room and take deep inhales. Avoid spraying into your eyes. Travel time is part of your vacation. So bring a good audio book or some classical music on your phone, relax and savor your journey! Disclaimer: The statements made in this blog have not been evaluated by the U.S. Food and Drug Administration (FDA). They are not intended to diagnose, cure or prevent any disease. If a condition persists, please contact your physician or healthcare provider. The information provided is not a substitute for a face-to-face consultation with a healthcare provider, and should not be construed as medical advice. Argentyn 23 manufactured by Natural Immuogenics is our top choice for consistent and safe immune support and microbial control. Now it is easier than ever to have Argentyn 23 available at all times with the NEW amazingly cute 1 oz. size bottles. In addition to taking them everywhere, they make great gifts and can be carried on to airplanes legally. The new 1oz. sizes come in a vertical spray for sinus application, a horizontal spray for throat or skin and a bottle for internal use. I personally would not travel without Argentyn 23 and this new size makes it easy to administer while in transit to anyplace. Argentyn 23 is hands down the most significant speciation of silver for antimicrobial effectiveness available today. Speciation refers to the specific critical properties of the finished product imbued by the silver sourcing, preparation and manufacturing process. Contrary to what those with little knowledge of silver say, silver is NOT a heavy metal and is not at all dangerous to the body. Silver in various forms are utilized in hospitals, NASA space ships, and U.S. naval vessels for its disinfectant and healing properties. Up until the last hundred years and the advent of modern antibiotics, silver had played a very important role in the medical pharmacopeias from family physicians to surgeons. Natural Immunogenics high quality silver products are delivered in brown glass bottles as silver should never be stored in any type of plastic. Silver releases phthalates from the plastic and we all know that phthalates are endocrine disruptors. In my mind selling silver stored in plastic is tantamount to holistic health malpractice. Many silvers are easily but poorly made and have impurities, or are bound to mineral salts or proteins that invite various problems. The lack of effectiveness of non-hydrosol and impure silvers are due to much larger particle size and inability to generate an oligodynamic highly energetic level of activity. This was a key reason as to why I chose to not embrace silver products previous to my work with Argentyn 23. It is the electron activity of silvers that disrupt and degrade the cell membranes of microbes. Size, dispersion and purity make Argentyn 23 the only speciation of its kind. This is the reason for the effectiveness of Argentyn23 and can be proven and validated through Transmission Electron Microscopy. Third party testing with infectious agents have shown the effectiveness of this speciation against all others. The Argentyn 23 is the professional brand while the Sovereign Silver is the retail brand.